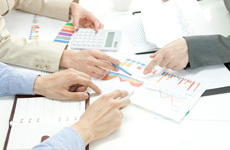 Holding large amounts of waste paper at your office? If you bring them to our mills there won't be any charge, and we will visit you for collection at reasonable rates. If you have been disposing waste paper as industry waste, those costs will be reduced. If you can bring a certain amount of waste paper (10 kg or more) , we may pay for it including shredded paper. We can accept waste paper that are hard to recycle, based on co -operation with paper making companies. Don't hesitate to contact us about it. You can bring your waste paper into our mills at your convenience, dropping by during your drive. There will be no complications. You can recycle confidential documents safely with our toll confidential documents recycling service. We will issue a certificate of this recycling for proof. 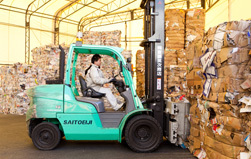 As we have a lot of waste paper such as brochures, instructions and other documents, we started to have sales employees bring those paper to the mills of Saito-eiji on their drive to work. It is very helpful to keep the office clean and to reduce the cost for disposal, as well as recycle shredded paper. Waste paper from our office is mainly from kid's studying papers. We used to dispose of those papers as industrial waste and the cost was not ignorable. Now we have these papers picked up by Saito-eiji, it made it much easier to carry out the paper as well. It is an easy process for women and the elderly as well. If you come by a car, we will help you unload the waste paper after getting the car on side of unloading area. . There is no charge for this (Except recycling confidential documents or other services) If the amount is large, we can pay for the waste paper depending on materials and the condition. Please contact us for more details. We pick up your waste paper free of charge if within 15 minutes' drive. Contact us for farther area as well! If you don't have any time or method to bring in, we will arrange a pick up at anywhere you like with our trucks. Please contact the headquarters by phone or email. Let us know your available date, time, place, and amount and description of waste paper. We will pick up free of charge in case of within 15 minutes' drive. You will be charged if in an area further out, and we will submit the quotation in advance based on the conditions of the pickup. For a large amount of waste paper, there may be discount or exemption of the charge. We recommend to combine your waste paper with the neighbors to have it picked up. Please contact us for the other materials than above.